I know I’m a few years late on this, but I can’t have an entire section of this blog devoted to Camino de Santiago without mentioning The Way. This movie is invariably a part of the first question people ask me when they’ve heard I walked the Camino Frances to Santiago. The movie was released in 2010, and really started to generate a following around 2011-2012 before I walked. I made a point of it not to watch The Way before leaving, and instead left it to a nostalgia piece upon returning. As a well rated movie on Netflix, it has been very nice to see the Camino enter the public consciousness here in the United States. I’m sure the Pacific Crest Trail will begin to see a similar influx of hikers due to Cheryl Strayed and Wild. 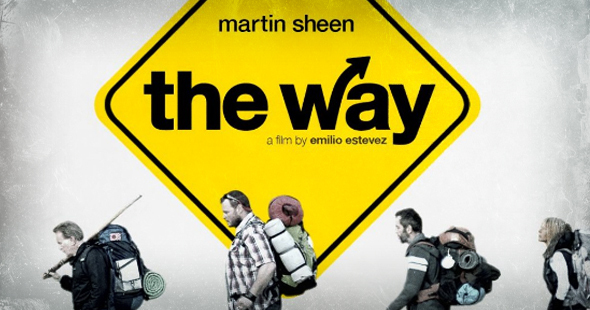 They Way focuses on the journey from St. Jean to Santiago and beyond by a grieving father named Tom, played by Martin Sheen. His son Daniel, played by Emilio Estevez, passed away while walking to Santiago. Although it is incredibly rare for pilgrims to die along this pilgrimage, it has happened more than a few times in the past. Daniel died at the very beginning while walking in the Pyrenees. Upon receiving the dreaded call from the authorities, Tom flies out to identify the body. Upon learning about the nature of his sons death, Tom decides to pick up his pack and walk in his stead. Daniel was a grad school dropout who disappointed his father Tom, an opthamologist, by quitting school and traveling the world. Without ruining the plot, the father son dynamic between these two was strained, and sets up a compelling internal dialogue of grief and regret for Tom throughout. More importantly, this story arc makes for a very inspirational and satisfying payoff at the journey’s end. My favorite part of the Camino, and any story I hear about trips to Santiago, centers around the characters. With pilgrims walking from all over the world who share different backgrounds, age groups, ethnicity, and lifestyle, the stories surrounding the people are equally as compelling as the gorgeous landscape they walk in. Estevez said he drew inspiration from the Wizard of Oz when writing the screenplay for The Way. I can see this in a lot of ways, as the characters stay close to being one-dimensional, yet interesting and entertaining. The main character, Tom, meets a main cast of three pilgrims that he spends most of the film interacting with. I think my favorite was the Dutchman Joost, as I tend to gravitate to characters offering quality comic relief. I also have very fond memories of joke telling pilgrims I met on my walk. Sarah, the Canadian fleeing an abusive husband and hoping to quit smoking, comes off as the cliche tawdry paper women so often portrayed in Hollywood films. This would usually bother me, but art imitates life, and there are actually a lot of broken souls like this on the Camino. The final pilgrim in the troupe is Jack, embodying another tried and true Hollywood cliche. Jack is an Irishman suffering from writers block and walking in hopes of finding inspiration. His dialogue is well written, and behind Joost, my second favorite character. Tom starts out as a grumpy old man wanting to walk and wallow in his grief alone. The beauty of this film is that it shows a realistic story of a broken man opening up to others. Pilgrims walk for different reasons, some for fun and others for penance. It’s hard to find two identical stories. That is the real beauty of each and every day. Every pilgrim that enters your life has stories and perspectives to offer, leaving your life story richer with every sunset. In the end, Tom realizes how much his fellow pilgrims mean to him, and how they’ve all helped each other overcome the obstacles and grief that had been blinding them in life. I would highly recommend this movie for anyone interested in Camino de Santiago, even if you’re not actually considering walking it. Much like the Camino itself, the process of shedding the “old you” and embodying the ethos of a pilgrim can be life changing. I did not expect to like this movie as much as I did, but it just brings back so many great memories, there is almost nothing bad I can say about it. i loved this movie when I saw it, and its great to see what someone thinks that actually did the trip. Thanks for sharing! Thanks for the review, it stirs up pleasant memories. I saw the movie before the hike and thought it was just OK but after the hike it became delightful. It may be a little predictable but I would give it two thumbs up now. I agree. Going in, I had a feeling I already knew what the plot would entail. Even though that held true, I still enjoyed it! I just finished watching your Inca video and was very impressed. Your voice and photography, especially the still photography, was great. Old Blue looked like a heart breaker. Best wishes on the JMT. Thanks for watching! Blue was definitely a heart breaker. I just love dogs, and unfortunately there are a ton roaming the streets of Cusco. If I lived there, I’d be the crazy guy taking care of all of them. Like you we chose to NOT watch it before we went. Actually, we didn’t even know it existed, until after we decided to go, work colleagues were telling us to watch it. And then on the walk itself, everyone was raving about it. When we came home and finally got around to watching it, we felt it didn’t represent the experience, at least not the way we did. So we didn’t really enjoy the movie. And interestingly as well, we had Camino friends who loved the movie before they walked and then had a change of heart on their return when they rewatched it. Very easy to see that being the case. It definitely was not written by someone who had actually walked the Camino. Entertaining: yes. Accurate: no 🙂 I’ve seen a few thru-hikers who have walked the Pacific Crest Trail saying similar things about Wild. I adored this movie. My nephew watched it and is convinced that I will take him to walk it when he turns 18. Not sure which is more frightening.